The other day I came across this heart-warming story about a young Jewish couple, interred in one of the work camps during World War II. She wanted to be married in a white dress, and he wanted to make her dreams come true. 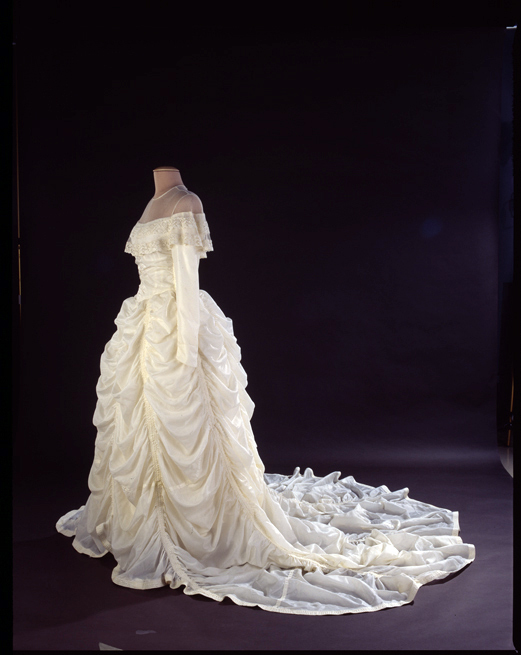 Sixty years and dozens of brides later, the dress was showcased in the Holocaust Museum. Made from a parachute, the well-worn dress became a symbol of love and hope in a time when hatred and despair prevailed. Like many of the signs and symbols of our lives, the worth of this sacramental of love far exceeded its monetary value. I recently broke down and replaced my three medallions — tiny silver likenesses of St. Teresa of Avila, St. Teresa Benedicta of the Cross, and St. Scholastica (Benedict’s twin sister). One was actually irreplaceable — I had purchased the original in Avila when my husband and I were in Spain eight years ago. I lost them in the move a year ago, and only now have reconciled myself with the idea that they are never going to materialize . . . So I got a new set when I decided to start blogging again. This time, I added a tiny St. Christopher medal. Somehow, he is never far from my thoughts these days. The sacramental worldview — informed by the belief that God gives us extraordinary graces through the tangible universe — is an intrinsically “Catholic” one. The God who reached through time and space to relate to us through the Incarnation, by enfleshing himself as one of us forever altered the way the physical universe interacted with the metaphysical one — including the communion of the saints. One of the most important ways we can lead our children to God is by making the family of God more “touchable” — engaging all the senses in order to better understand who God is, and what he wants from us. These points of connection, like my faith medals and the heirloom wedding dress, are important signs of life and faith, pointing us not only to where we have been but to our ultimate destiny. So, moms, what are you going to do this week to make signs of God’s presence come alive in your children’s lives? This entry was posted in parenting, personal growth, St. Scholastica, Teresa of Avila, women and tagged Catholic parenting, Edith Stein, Faith and Family, sacraments, saints, special needs children, spirituality, St. Scholastica, Teresa of Avila by heidihesssaxton. Bookmark the permalink. I pray that the Power and Presence of Christ Jesus is tangibly present to all this week. Touch every life with your perfect Love. Touch every heart with your perfect peace. Touch every mind with your perfect joy. Touch every person with your healing and wholeness. Come Holy Spirit in your power and might! Veni Sancte Spiritus!